Are you hoping to spend some quality time on an alien planet, hunting down a ferocious monster? Or perhaps stalking a group of invaders encroaching on your territory is more your cup of whatever people drink in lieu of tea in the future and across space. 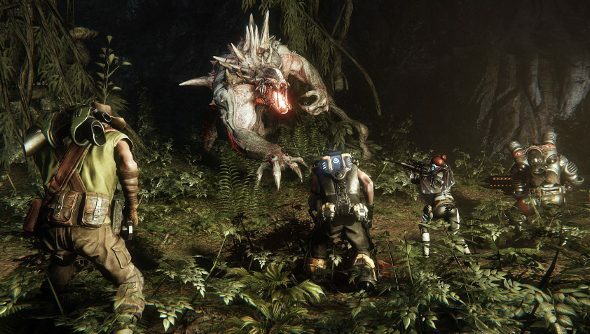 Good news, then, because Evolve alpha keys are being sent out to a lucky few. The first alpha test is for us PC lot only, and will run from tomorrow until Sunday, August 3rd. Have you discovered your invite in your inbox? Unfortunately, there will be an NDA, so you won’t be able to boast about your 4 vs 1 exploits. But at least you’ll still be able to share the thrill of the hunt and the kill with your new alpha buddies. Soon, some of you might be able to get a taste yourself, and take sides in this battle of opinions. Of course, you’ll have to do it in secret. Perhaps you could send Steve or Rob anonymous, perfume-scented letters. “I’m with you, brother,” they could say. And they’ll know what you mean, and it will just make their day.